According to Traffic Generation Cafe, once you write between 21-54 blog posts, you actually increase traffic by up to 30%. The above statistic is extremely important because it shows how influential blogging can be, especially when you create more content on a consistent basis. Standing out online can be difficult, especially as a small business. Since writing my first article I have realised that it is an amazing way for me to connect with my target audience and also drive traffic to my website, and turn visitors into prospects. 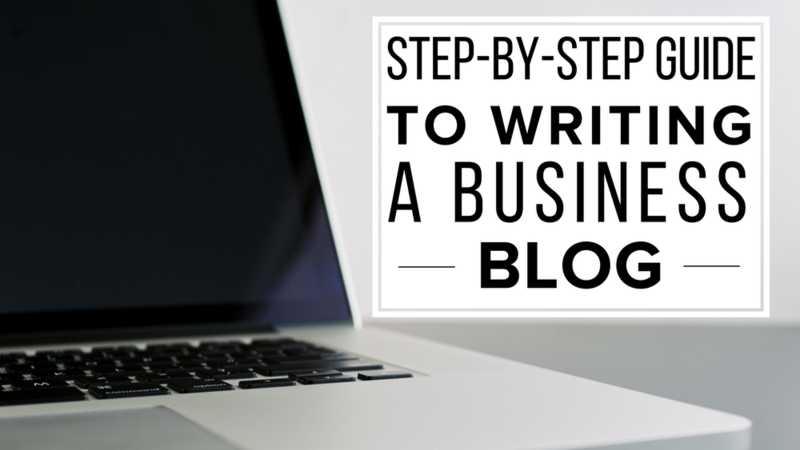 To help you achieve success through blogging, I want to share with you my step-by-step guide to writing a business blog. If you make writing a business blog a priority, you are 13x more likely to achieve a positive ROI (return on investment) which means that your efforts will be heavily rewarded, the more you blog. If that isn’t enough to convince you, let me explain further. I initially started blogging to talk about my business and to have content to share on Social Media but as I evolved as an influencer, I looked at the bigger picture. Blogging has been one of the strongest lead generators for me. Once I acquire a lead through my blogs, I will nurture them through further content and actually turn this visitor into a prospect and then to a paying customer. Now that you know WHY you should be blogging, let’s take a closer look at my guide to writing a business blog. Step One; Where Are You Blogging? If you’re new to blogging as a business, you may not have a website or blogging platform in place and for you to get started with writing your small business blog, so you need to look into a platform to use. If you already have an existing website that doesn’t have a blogging feature, look at the platform/provider you are currently using to see if they give you this functionality. If you had your website created by a web developer, ask them about adding blogging functionality. Are you looking for a blogging platform? Take a look at WordPress. As a small business, you might not have the budget for something advanced so using a platform like WordPress will give you the ability to create a free website that can evolve over time. Part of blogging, is understanding what others in your industry are doing well, and understanding your audience to create content that connects with their needs. If you are a start up business, and yet to make an impact with writing your business blog content, take a look at your competitors. Observe how they are communication with their audience, the articles they are posting and the unique content they are writing. This will give you a good indication of the type of content you should be sharing, as your target audience is the same. I look at my competitions as a place for inspiration, and understanding. This is a very important step for me, and one which I do on a daily basis. Without doing my research using a tool like Feedly to see what other industry thought leaders are sharing with their audience, I may find that my articles are not following the current trend, or not what my audience need from me. If you have an already existing audience whether this be through Social Media or email marketing, you have the opportunity to create great content because you can speak with them directly and find out what they want. If you have a following on Social Media, run a poll inside of your social networks. If you are going to do this, think about only giving 5-6 potential poll answers otherwise your audience will feel overwhelmed. When looking at writing a small business blog, using email marketing to run a survey. Google have a great survey feature, or; take a look at SurveyMonkey. From analysing my content, and speaking with my audience I found that certain “types” of content performed better than others. “How to” articles were a regular appearance for the “needs” of my audience. This type of content is informative, easy to follow and step-by-step based. Articles of mine that fit this criteria include “How To Find An Email Address In 60 Seconds”, “How To Write The Perfect Headline For A Blog”, and “How To Design A Digital Marketing Plan As A Small Business”. I also understood that love articles that either start with the number five, or the number seven. Most small businesses are time poor, which means they don’t want to read an article that has more than “7 ways” or “7 tips”. I found that the numbers five and seven appeared more frequently than any other number e.g. “5 Ways To Nurture And Win New Customers”, and “7 Tips To Writing Perfect Content”. Writing perfect content for your target audience can be difficult. I’m here to tell you that you DON’T need to spend hundreds of pounds on writing content for your blog, nor do you need to outsource if you take the time to understand your target audience and do your research. There are two great tools that I want to share with you to help you create a great blog headline. The first is Hubspot’s topic generator. Hubspot have a great headline topic generator that once you add your keywords, it generates potential headlines for your blog. Use this tool for inspiration, but always tweak the headline to make sure it will work for your audience. You can then take this headline and analyse it inside of CoSchedule’s headline analyser to make sure you have a headline that will generate blog traffic. As important as it is to know your target audience, it is equally as important to know your keywords. This is based on how you define your business online. How you define your business online leads to the type of content you share. Your keywords help you build your content marketing strategy which is what will ultimately drive more traffic to your business. Use your keywords as a guide to creating your SEO. We are now in the experience economy, and the way we write our SEO now needs to be focused on long-tail keywords, rather than just one word keywords. By understanding what works for your audience, you will have a better idea around HOW they search and this in turn, will help you craft your SEO. If you are using WordPress, install a plugin called Yoast to help you analyse how effective your SEO is for each blog you post. I hope that my simple and easy guide to blogging will help you create content your audience will love. Over the last nine years I have written over 1,000 articles, and have acquired more than ONE MILLION visitors reading my blogging content. How would you like to be able to achieve the same? Click below to access the recording.